Helping businesses prosper in South Metro Denver since 1921. ​We have humble beginnings and have not forgotten our roots. 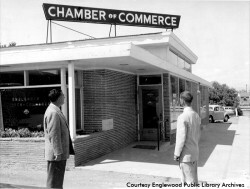 What began in 1921 as a small town Chamber of Commerce has transformed to a key player in the South Denver region: influential in 4 counties and 18 cities with over 650 business Investors. We are ready to serve you. Our leadership has helped guide our business community constantly forward toward prosperity. Through our wide variety of events and subsequent collaboration you will meet and get to know other business leaders who can listen, bounce ideas back and forth, resolve issues, and find solutions to your business challenges. Through these action-oriented initiatives, we provide value to our members and an environment for growth and prosperity. Learn more about becoming a member of the South Metro Denver Chamber.